Go betty! she looked very happy to be at the emmys. not everyday you see a TV legend get a standing ovation! Fan of TV, including Golden Girls, Growing Pains, Wentworth, Empty Nest, JAG, NCIS etc. Loved seeing here there. Hope she's there when she's a 100! Blanche: Rose tells us you're gettin' married. Sven: Yes, and I hope I'm good at it. I don't have that much experience vith vomen. Blanche: A big, strong, handsome thing like you? Get out of here! Sven: Vell, it vas nice meeting all of you. Check out Betty on Match Game! 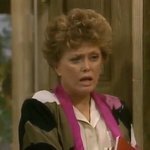 Aussie|Known on Twitter as @jasongjohnson20| Watch #GoldenGirls and a bit of #Maude| Write a little about the show, hope you don't mind, lol. this is the one video when you realise that Betty and Rue were truly close..